Making gluten free puff pastry is a snap, when you have the right recipe. If you’ve ever had trouble understanding the butter packet, or the “turns” that create all those flaky layers, a how-to video is just the thing you need. 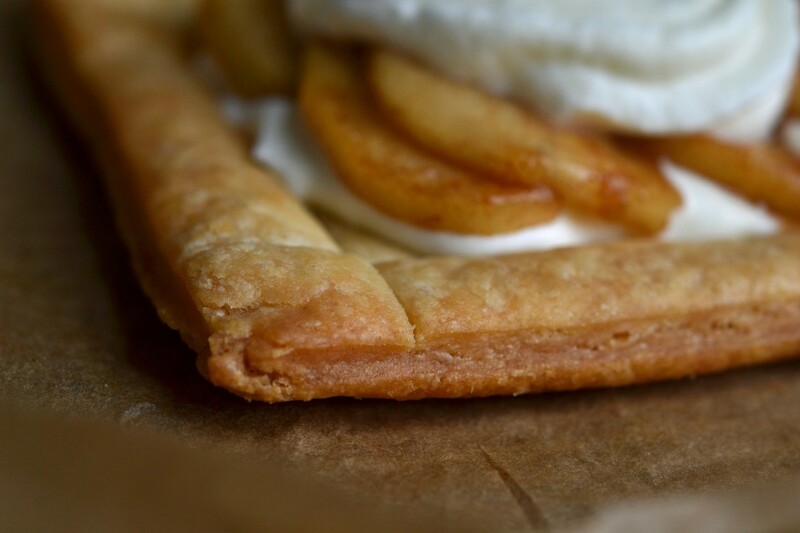 If you can make gluten free pie crust, then you can make gluten free puff pastry. And you can make pie crust. I promise. There are a few basic principles to keep in mind whenever you’re making any pastry of any kind. Gluten free or not. First, everything should be kept cold—but not rock solid cold. That is especially true when it comes to puff pastry, as opposed to, say, gluten free biscuits. The larger the piece of butter you’re working with, the warmer it can be without causing problems. Let me explain. Puff pastry is made by creating a simple pie crust, and wrapping it around a packet made entirely of 1 whole cup of butter. Once the large packet of butter is wrapped in the pie crust, it’s rolled out into a rectangle. The first “turn” is simply the first time the dough-wrapped butter packet is rolled out into a rectangle and folded in thirds. After that first turn, the tripled dough is made up of 3 layers of butter surrounded in alternating fashion by 6 layers of dough. When the turns are repeated between 4 and 6 times, the layers multiply exponentially. In pastry-making, the butter is kept cold before going into the hot oven. Like ice, when butter is cold, it contracts or is made smaller. When it is heated quickly, like in an oven, it expands. When the butter is in many, many layers, and is surrounded on every side by the dough, it pushes out the dough and creates all those flaky layers we love. Larger pieces of butter can warm, but once chilled will regain their original shape, rather than melting into the surrounding dough. If you try to shape the butter packet when the butter is rock solid, you’ll find it almost impossible to shape. If you being with slightly warmer butter in creating the packet, you can shape it as you like, and then chill it until it’s firm. It will then retain its proper shape during the rest of the shaping—and during baking. This puff pastry can be frozen for months (just defrost overnight in the refrigerator before using), and is easiest to work with when it’s been sitting out on the counter for about 10 minutes. 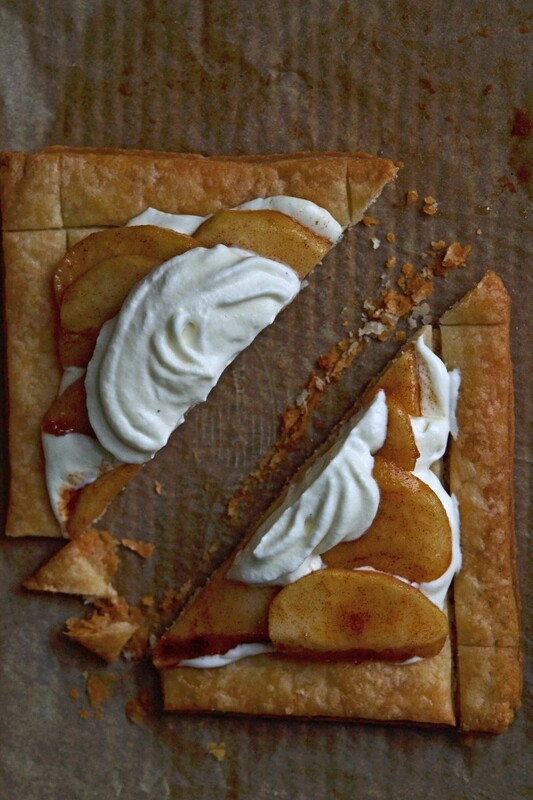 Use it for super easy sweet desserts, like the open apple tart you see above. Or make it savory, like I did by making puff pastry cups. I topped them with the filling from the Spanakopita Bites in my new cookbook, Gluten Free Small Bites. They’re also lovely just filled with pastry cream or whipped cream and some fresh berries. First, make the dough. In a large bowl, place the 2 cups flour and salt, and mix or whisk to combine well. Add the chopped unsalted butter and toss to combine. Press each chunk of butter flat between your thumb and forefinger. Create a well in the dry ingredients, and add 1/2 cup of ice water to the center. Stir the mixture to combine. Add more ice water by the tablespoon until the dough stays together when pressed. Press the dough into a ball, place it onto a piece of plastic wrap and wrap tightly. Place in the refrigerator to chill until firm while you make the butter packet. Make the butter packet. Dust a sheet of parchment paper or bare flat surface with 2 tablespoons of flour. Place the two sticks of butter, side by side and touching one another, in the center of the flour. Sprinkle the butter with the remaining 2 tablespoons flour. Cover with another sheet of parchment paper (or not), and pound the butter with the rolling pin to begin to flatten it and to press the two sticks of butter together. Remove the top sheet of parchment, fold the butter in half, and cover once more. Pound again until flat, and repeat the process until you have a butter packet that is about 4-inches square. Wrap the butter packet tightly in plastic wrap and place it in the freezer to chill for about 5 minutes, or in the refrigerator for about 15 minutes, or until beginning to firm. Combine dough and butter packet. Remove the chilled dough from the refrigerator, and place it on a lightly floured surface. Sprinkle lightly with more flour, and press and roll the dough until it is smooth, folding it over on itself as necessary. Press it into about a 6-inch round. Unwrap and place the chilled butter packet in the center of the round of dough. Lightly score the perimeter of the butter packet, and set the butter packet aside. Dust the top of the dough once more with flour, and roll out the dough from the 4 scoring marks and out, away from the center of the dough, to create 4 flaps. Dust with more flour as necessary to prevent the rolling pin from sticking to the dough and move the dough frequently. Place the butter packet back in the center of the dough, and fold the 4 flaps onto the butter like you would the bottom of a cardboard box. Press the dough around the butter packet to seal it in. With a floured knuckle, make one single impression on the dough, to represent the completion of one turn. Cover the dough with plastic wrap and place in the refrigerator until firm, about 15 minutes. Once the dough is firm, remove it from the refrigerator, flour the outside and once again, with a long side of the folded dough facing you, roll away from you and into a long rectangle about 1/2 inch thick. Fold once more, and mark the dough twice with your knuckle, to represent two completed turns. Refrigerate until firm, and repeat the process of rolling, folding, marking and chilling for at least 4, and up to 6, turns. After the final turn, fold the “business letter” of dough in half or thirds to create a smaller packet. Wrap tightly and refrigerate or freeze until ready to use. If you freeze the puff pastry, defrost overnight in the refrigerator before using. Originally posted on the blog in 2012. Video added, recipe clarified, more photos added of Spanakopita Puff Pastry Cups. Do you think this could be rolled out very thin & used to make baklava? Baklava uses filo rather than puff pastry. That is individual layers of dough painted with oil in between. It might work to omit the butter packet, and roll it thin then brush the layers with melted butter as you would with normal filo. I think if you used the butter packet rolling it as thin as possible would smash the layers into one anyway. Well what could be better than that, Erika? Go for it!! This recipe has challenged me and scared me to death since you sent it out. I have read and re-read the directions and watched the video so much I think I may wear it out. Everyday I think I’ll try it today and then I say, no tomorrow but tomorrow never comes. So today I decided that I really don’t like puff pastry that much anyway,ha ha ha! So thanks for ruining my life! I was really just kidding around and criticizing myself. I certainly didn’t mean to offend you! If I did I’m the one who’s sorry! Oh, I totally remember sorrynotsorry and what was even more insolent was “whatever”. I have a really good Idea. You manufacture the puff pastry and sell it to the stores. Everyone will buy it, you’ll make a lot of money and I won’t have to suffer over this recipe anymore! Sound good? Is it possible to make this dairy free as well? Would Earth Balance work? Never use Earth Balance for pastry as it has a very high water content, so it won’t hold its shape and puff out. It will just melt. Try using butter-flavored Spectrum nonhydrogenated shortening. When it gets too cold, it is really solid, so you’ll have to be careful with temperature. I just made a non GF grilled cheese sandwich that uses a croissant and I asked a friend of mine if she had ever made a GF croissant…she sent me here! Love that I’ve found a recipe I can share with my GF friends that haven’t had a croissant in years! So great that you have found a mix that you are happy with for puff pastry!! I have tried and given up numerous times… I find that my problems are usually 1.) butter breakthrough upon rolling out the détrampe the first time – and once the butter comes through the dough it seems no act of repairing on my part will keep the butter at bay – and 2.) because of #1, when I bake mine the butter oozes out since it is no longer confined to its requisite layers, and thus essentially fries the outside as it cooks rather than creating lovely steam pockets to puff into layers. I’ve read that puff pastry should puff to 6x its normal height, but because of my issues I’ve never gotten GF puff pastry to “puff” at all. I’ve tried different mixes systematically altering the starch ratio of my GF mix, using gums or not, different butter temperatures, different techniques of making my first packet, and yet always seems to deal with the same issues. So far the best I’ve come up with is a very crispy sort of fried pie crust like result, which while tasty, isn’t really “puff” pastry without the “puff” part. Any tips on what I’m doing wrong? Yup. I have a few ideas for sure. And I love how scientific you are about this. That means you’re going to be successful – and it’s going to be fun (well, for me). Second, since the blend is more about how easy it is to handle (and easier to handle will lead to earlier success), it really comes down to the method – and the environmental conditions. Usually when the butter packet is breaking through, it’s a temperature issue. You want the dough and the butter packet to be at the same temperature as one another, and it’s okay to err on the side of having it be too warm while you’re handling it. You shape it, and then chill it so it doesn’t truly melt. When I shape the butter packet, it’s often soft enough that I could roll it into a ball rather easily. Since the dough will become a bit sticky if it’s warmer, just dust it with some starch (or more flour). It’s drilled into our heads that pastry elements need to be cold for maximum success, but it’s rare that the problem is actually that the butter has melted into a liquid form (which is the only way that you can’t chill it back to life). You’re motivated, so you’ll get it right. And you’ll feel like you won the lottery when you do! Well I was scared to make sourdough (make that intimidated) and I did it and my family loves your recipe! Now I am intimidated by puff pastry. If I made really great coffee and something yummy for breakfast, could you just come by and lend me a hand? How I would love that! How about July 2012, in California, my friend? I’ll do a private demo. :) Oh how I would love that, too. Pencil me in? Wow! That looks very good! I love how the browning looks very nice and even. The texture looks great. Some GF flours are just too stiff to do something like this puff pastry with. The Better Batter looks pretty good – I’ve never tried it. I remember, ages ago now, when my father took me to Redondo Beach Pier…and there was this one food stand that sold these flaky dough pastries…the same kind of flaky dough used for baklava…but it was with ground beef…so tasty good delicious…and I’m thinking this puff pastry would be awesome to make that!!! The dough typically used for baklava is filo dough, which is a bit different than puff pastry since it is typically very thin sheets of dough with butter between the sheets, instead folded into the dough itself like puff pastry, but this would certainly work beautifully! I hear that, Heather! Today is my first day coffee-free for the same reason! This looks wonderful (and just the type of nerdly kitchen experiment I love. Pure bliss is an afternoon playing in the kitchen with my equally dorky spouse!) and something I’m going to have to try soon. Thanks for yet another rung on the GF ladder to reach for. I use to use puff pastry all the time (before celiac diagnosis) and I truly miss it’s versatility. Also? I’m thrilled to see that you are going to put up your own GF-all-purpose hack at long last. 90% of the time, I mix up various versions of my own and I am looking forward to seeing what you use. While I understand the appeal of the purchased mixes… well. Between the price (I’m cheap) and the shock I got when I finally bought BB (Last week was a week of glory AND despair. Bought BB finally to try the doughnut recipe with. Had my first stunning glorious doughnut in 3 1/2 years… quickly followed by an epi-pen inducing despair when I found out that the ‘made on a line with nuts’ thing whacked me but good!) I have had to pretty much swear off buying premade anymore. Really looking forward to seeing what you come up with. No… off to see just HOW much butter I have in the freezer to start working on the Puff! I’m really glad you’re excited about making puff pastry! Are you saying that you had an anaphylactic reaction to Better Batter? They have been tree nut free for a year now, so unless you used an older package somehow, I can’t imagine how Better Batter could have triggered a tree nut allergy. I believe that Naomi Poe herself is tree nut allergic, even, and safely uses the flour. Good thing you had your epi pen ready! Maybe you reacted to one of the other ingredients in the doughnuts? The older package is highly possible – the local health food store has had issues with rotating their stock. From old packages to “helping” folks by grinding vast amounts of brown rice in store… and leaving it to sit at hot store temps for 6 months. (I’m ‘lucky’, I’m one of the small percentage of folks who can taste grain rancidity. When I called to complain… I got a “Oh, you mean brown rice can go BAD? How were WE to know” and found out quite a few folks have gotten sick. ) I should know better then to shop there. It was either an old package with nut traces, or they have either latex shoots (common with flour plants – and an allergy that makes me crazy. As this is a family site – lets just say I discovered THAT allergy on my wedding night. And my husband and I spent the rest of the week playing video games. Le Sigh) or they randomly have something in the plant with bananas. (Seriously – if I was a building, my parents would never have been given a permit to have me. My genes are frustratingly wacky) It’s kinda been a week of discovering new ‘issues’. First the BB, then my mom accidentally glutened me during a visit, and today… I’m back in a epi-haze because the gelato my husband bought me to cheer me up switched it’s ingredients since the last time we purchased it, and we were both too dim to check a supposed safe… and failed to notice the “Trace tree-nuts” new warning. You poor thing. You certainly do have an active immune system! I want you to know that you really can trust Better Batter’s products, if you ever feel like trying it again. But I can also understand wanting to exercise more control over what you eat. I’m so happy that I’ve been able to help you rediscover a sense of possibility in food. You can and should eat well, and, like you said, it’s going to be “awesome.” Now get back in that kitchen! Really liking this series. And thanks for the knuckle tip. That’s a good thing for people like me who forget what the heck I was doing or how many times I was doing it… I miss puff pastry. But no more. Thanks! Every puff pastry recipe I have ever seen suggests marking the dough, but they don’t seem to ever make clear that you have to mark it anew with each turn. In other words, you don’t just mark it once after the first turn, and then mark it just one more time after the second. After the second, you mark it twice, since with each new turn, you’re rolling smooth the previous turn’s markings. Maybe I’m just rather dense, but it took me quite a while to figure that out!